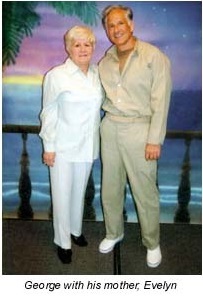 George Martorano has been released! He was finally set free on October 5, 2015. 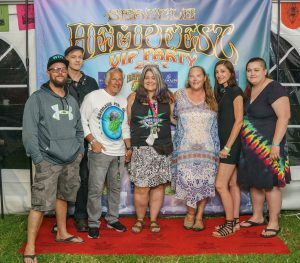 Having him at Hempfest 2016-current has been a absolute honor! 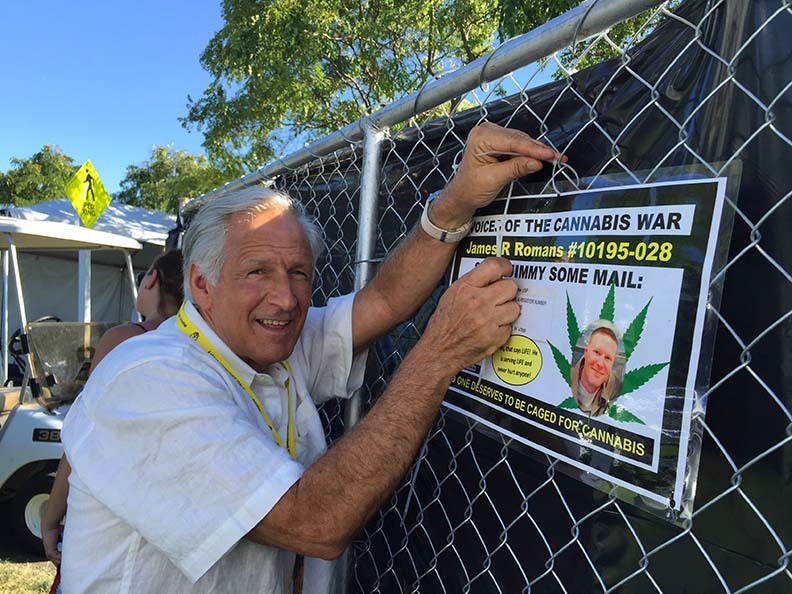 George spoke on multiple stages and volunteered helping hang our Jimmy Roman’s & other prisoners signs! George will be producing the Atlantic City Hempfest in 2019! We are beyond proud that George will be continuing the Hempfest legacy of free speech & education in both New Jersey & Pennsylvania beginning in 2019! He had been in prison for 32 years, and has written over 30 books. His is one of the longest serving, non violent offender in the history of the Federal prison system. He is a writer and a poet. He has appealed his case 35 times and has had no luck getting released. He published a “Self Help Booklet,” which has been approved by the Federal Bureau of Prisons (FBOP) and is used for reentry programs. He has created a writing course called “The Write to Life” that has helped dozens of inmates earn GEDs and develop creative writing skills. He is also a certified suicide watch counselor and uses himself as an example, saying, “If I have hope facing what I am facing every day, so can you.” He is also one of the first if not the first federal inmate to exercise his First Amendment Rights by publishing his work on his blog and his website (www.webelievegroup.com). He also has another website, www.childrenontheoutsidewithparentsontheinside.com, which helps children cope with their parents’ incarceration. 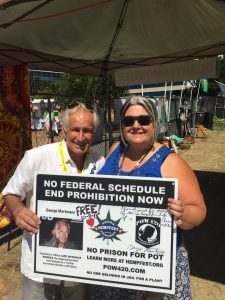 Seattle Hempfest recently “adopted” George, raising money to help George with his commissary money in prison. We hold raffles for George & Jimmy at our Membership events. Today, I write this as I have so many times over the prison years…..under a lock-down. Lock-down is when the entire prison is secure. Where all prisoners are quickly herded into your cell, any cell in fact. One has to hope he is near his…..Once you are in a cell. The steel door is locked fast and that is it until the dangers are over. That could take two days to six months. It is according to how much blood was spilled…..Of my prison years, the only life as I know it. I truly have lost count of how many lock-downs I have been subject to. I can say I am a pro at it. For I know no matter how tranquil the prison day is. A day of me teaching, mentoring, a lock-down will come sooner or later. So, I know to keep certain items stored in my cell books, radio batteries, sustainable food items, etc…..Yet, being prepared does not matter if you do not have the right mental attitude….. Attitude….. What do I mean? Well, even if a man is in prison. When he gets sealed in his cell, his own mind can come heavily down upon him. He totally believes the very, all, is lost. He curls up on his bunk for days on end. He totally believes, he totally feels the very meaning of lost…..What to do? What to do? Eat less of what’s in the paper bags you get three times a day. Lots of water is best. Take your narrow mattress and make a chair out of it. Fold it, tie it off with a long torn piece of sheet. For to lie on the bunk for hours and days is like a mist of cancer upon you. No, best to use the makeshift chair for at least 8 hours. Then, back onto the steel slab, and later sleep. When under a lockdown. You should work-out even more. Three times a day. Early morning yoga, afternoon upper body, then early evening jogging in place or step-ups upon the cell’s trash can. Wash. First. Make a screen of a sheet or blanket. Then you get naked and soap up then soak down. I use a lot of shampoo upon my head and use the suds downward…..Last shave, shave every day in fact. Do not worry about the cell’s floor. You get that water up later by rag or sponge. Of course read and write. When using the radio get the news, it at least makes you feel you are still a part of what’s going on in the world. For some, their minds shut off all more under a lock-down and they just, vegetate. If you are alone in the cell. One should sing to himself; a lifting for one’s spirit; even dance. No good being silent for long periods of time. If not alone, talk to your cellie in positive ways, no hateful language. Especially, if he is younger, inexperienced within the fourth world, prison. For he can become dark in his mental state; learning to be mean. When relieving one self, again you set up a screen of some sort. Best to run the sink’s faucet to create a sound over. Flush repeatedly…..For now within a lock-down you must stay pleasant in human form; more of a gentlemen as never before; even if you are by yourself. The very foremost of one’s self character. Yes, I have lived, been existing through countless lock-downs. Did some of my best writing when the steel doors have forsaken me. And when that steel door finally forgives, opens. I always pride myself by trying to look the freshest, the strongest, always delivering a huge smile. I stand there arms raised…..’ Everybody all right?!…. Though I am smiling, my heart gets saddened. For I see those that the lock-down has become as though a bad date. The old prisoners look older, their skin yellower, bodies more bent. The young are sour faced, unclean and starry eyed with confusion so laced with hate. All I can do is roam around the cell block looking to stop those readying to argue or worse. Ease them, make them laugh, for laughter is the greatest healer after released from the long bite of the four walls…..I have even lived through back to back lock-downs. You get out. They battle. Sealed in again…… Only longer…..
Federal prison in America, 2014.